Posted February 20, 2017 by Ian McArdell & filed under Books. 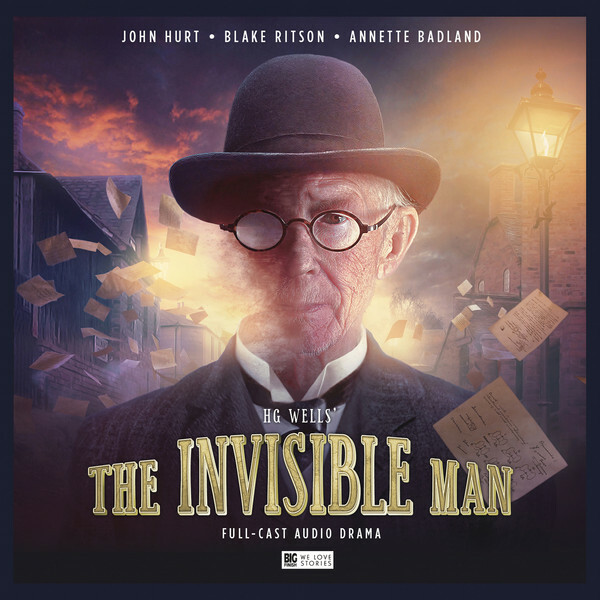 Kicking off their HG Wells season, which promises six stories throughout 2017, Big Finish present the incomparable John Hurt as The Invisible Man. Respectfully delayed by a few weeks for the saddest of reasons, fans can now enjoy the first of two bittersweet treats this month – not only does John Hurt voice the titular anti-hero here, but his other final piece of work for the company is released too – the fourth volume of War Doctor stories, ‘Casualties of War’. While Wells’ novel begins with a bandaged stranger’s arrival to the village of Iping, adaptor Jonathan Barnes judiciously adds a device to frame the narrative. Involving two of the book’s major players, Kemp and Marvel, it effectively ratchets up the tension from the start and allows Blake Ritson’s Kemp to set the tone. Barnes necessarily thins the cast list, with the curious villagers of Iping represented by few essential residents – so goes the Landlady’s husband and the Vicar’s wife – in the case of the former, building up the role of clock-jobber Teddy Henfrey (Dan Starkey) and making him gloriously in cahoots with the Landlady of the Coach and Horses, prying at her mysterious new mysterious resident. Thankfully the production dispenses with the Sussex yokel vernacular in which Wells chose to write the Iping’s residents and instead they are rather more lightly accented. Thanks to its enduring popularity, and particularly the memorable 1930s film adaptation, The Invisible Man is a story we thought we knew reasonably well. In truth, it was a far more raw and thought provoking tale than we expected; Griffin’s madness is superbly played by John Hurt who is irascible and capricious, you feel his desperation and his cunning as well as some sympathy as he tells of his miraculous breakthrough and descent into desperation. An admirable cast surrounds Hurt’s starring role. Annette Badland sparkles as the over curious Mrs Hall, while Blake Ritson’s urgent intensity makes him the ideal Kemp and he is paired for some time with the enjoyably larger than life Thomas Marvel (Peter Noble) who both offer narration to keep the tale moving. David Rintoul, Richard Dixon, Alex Clatworthy and Alexander Forsyth round out the cast, each providing at least three roles to populate the world. This is a terrifically well produced tale, highly absorbing and truthful to the wit and intelligence of the source material. Though poignant at present, we happily predict it is a version of the tale that we will want to return to time and again – and it certainly sets a high bar for March’s ‘The First Men in the Moon’ which has also been adapted by Jonathan Barnes and stars Nigel Planer. Released in January 2017 by Big Finish.